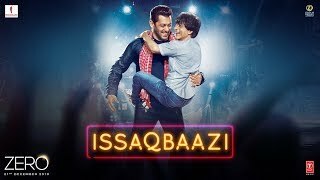 Issaqbaazi Lyrics – ZERO: The song is sung by Sukhwinder Singh & Divya Kumar and composed by Ajay-Atul while Ishqbazi Lyrics are written by Irshad Kamil. The song is from Aanand L Rai’s ZERO starring Shahrukh Khan and Salman Khan in a special appearance. Khadi ho jayegi khaat re..
Ho uska humra mel anokha..